Remember when I started a new Togue Pond Tank way back at the end of May? No…yeah I forgot it too. I got so caught up in knitting my Guthrie tee that I just kind of let this tank fall to the side. I decided it was the perfect plane/vacation kind of knitting so I packed it up with me and took it to Chicago and finished it on my trip (and started my latest secret test knit). 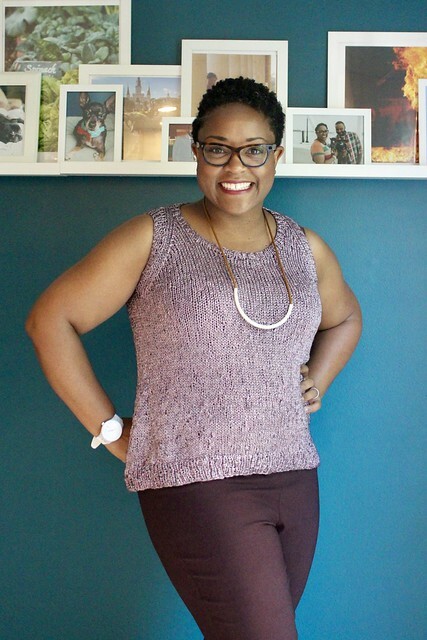 Despite the fact that I don’t love my arms, what I really don’t love is being hot in the sweltering heat and humidity and the Togue Pond Tank is pretty much the perfect summer knit piece. I’d rather have my arms out and wear a pretty top than try to hide my arms because I want them to look like Michelle Obama’s arms. Hence why this is my third for myself and I’ve made one for Jessica. I was actually replacing my very first Tank, it was a pale grey that had a big old stain on it I just couldn’t get out so I decided to make a new one for this summer. I decided to go with a fun yarn I like to use as a replacement for Quince & Co. Kestrel yarn. To be honest with you, I don’t always have a budget for the expensive yarns (who does), despite wanting them. Instead I find fun alternatives. This is Patons Metallic, you’ve seen me use it most recently and in this same color on the Baldric sweater for Jessica. It’s a tape yarn like Kestrel but it’s made of Nylon, Acrylic and a tiny bit of wool. I love the metallic colors and they’re forever putting it on clearance and then bringing it back to the regular line up (it’s currently on sale in the clearance section for $3.40, it’s regular price is $6.79). When you compare the two yarns, Kestrel costs $10.25 a skein for 76 yards and Metallic costs anywhere from $3.40-6.79 for 252 yards. This tank was less than 2 skeins of yarn, I know I got it on sale but not clearance so at most I paid $10 for the yarn to make this tank. It would’ve cost me about $40 or more with Kestrel. Now you understand why I like this as my substitute, but I also like the colors and the drape of the fabric. Jessica has already asked for me to make her a new Togue Pond Tank in the metallic black (black is her favorite color to wear…it breaks my heart LOL). Our trip was lovely. I did not take many photos at all. 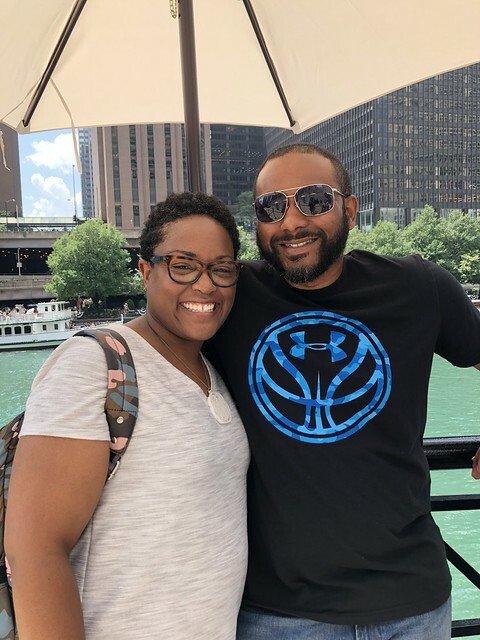 My cousin did take this great pic of me with my husband before we got on an architectural boat tour on a beautiful morning. I also took this pic. Totally got to wear my Durumi tee while I was there AND I found insanely bright knit Cole Haan wingtips with the Nike soles so I was super comfy walking through the city. It was so breezy and light, loved it! And the dogs…well they missed us. And Jellybean yelled at me all day Sunday and made me carry her everywhere as my punishment. 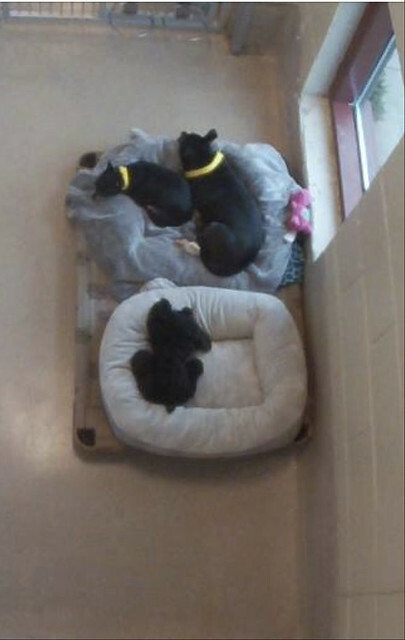 By the end of the 5 days we were apart she had wiggled her way into Cher’s bed at their pet hotel and made sure her sister snuggled her as much as possible. They got all the belly rubs and treats while I was away but it’s always good to come home. You look fabulous in that tank! I so appreciate your wide-ranging yarn choices. I, too, have budget constraints. I’ve learned over the years that it’s a mistake to put long hours into yarn that doesn’t wear well. On the other hand, there are some very nice budget yarns that continue to look good for a long time. Looks like you’ve found a winner. I suspect that you didn’t really mind your “punishment “!!!! HAHAHA no, I don’t mind. I was so surprised though. She’s been a lot more vocal with us since she got back. She will just howl in protest. She’s a sassy one. You are so beautiful, arms and all! Your short hair lets your face shine through! 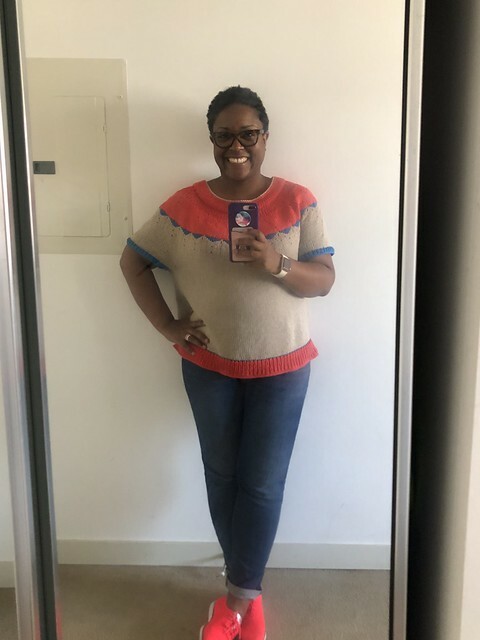 The sweater is cute, too! The tank is lovely, and you look great in it. Your color choices in all your knitting are fun and inspiring. I wanted to tell you how much I enjoyed the interview you did with Mason-Dixon (in June, I think). 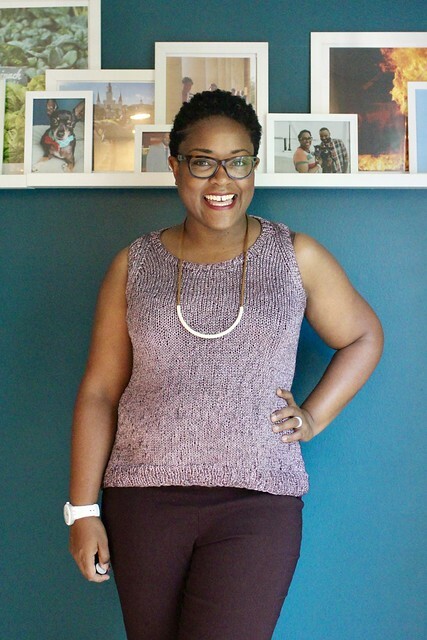 You mentioned in the interview that you enjoy recommending beginner sweater patterns for first-time sweater knitters, and I would love a recommendation! I really want to try to make one, and you’ve made me feel like I can do it. Thanks! I live in Chicago and am so glad you enjoyed your visit. The Architectural boat tour is the best. It’s such a beautiful city and fun to learn some of the inside scoop on the tours. Love your matching top and kicks. Well done. Wish I had run into you—I would have dragged you to my favorite yarn shops. I soooooo need someone to take me on a Chicago yarn tour. Don’t worry, I’ll be back again (I go typically twice a year to visit my cousin). I may email you next time. 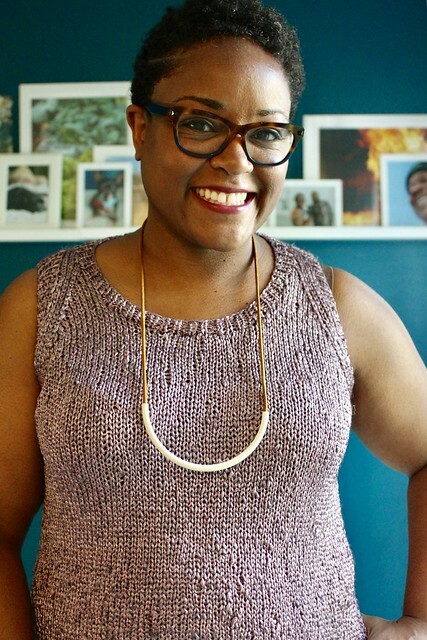 You, and your colorful, creative knitting, are BEAUTIFUL! You continue to inspire me!!! THANK YOU for writing the blog. Your tee is beautiful and I really appreciate the yarn suggestions. Keep up the great work!! Beautiful sweater. I love the color. I appreciate your yarn choices. The tank is lovely and I the color is great! BTW, I think we all wish we had those really buff,Michelle Obama arms and shoulders. Measurements! Have a friend measure you around the bust to know your correct size and measure from your armpit to your wrists to know sleeve length. Knowing your measurements and then swatching to get as close to gauge as you can will mean garment success. I love the rose color and the top looks fabulous! Did you actually knit on the plane(IJS)? Usually per TSA you can’t carry on knitting needles. Although, knitting on a flight would be so worth it! Here’s what I like the most about your blog—affordable options with web sites. You’ve helped me discover several new brands so I’m not locked into big box store yarn—perfect for small children. You and the tank look adorable! I’m also wondering about that lovely necklace — what a perfect accessory. I found your blog through MDK, and have been enjoying it and your great style. The necklace is from Maslo jewelry!